Charlotte makes spit look stylish in stunning new images for blood cancer charity Anthony Nolan. Hollywood actors, fashion designers, models, pop stars and TV darlings have come together to prove that saving a life is as simple as ‘giving a spit’. 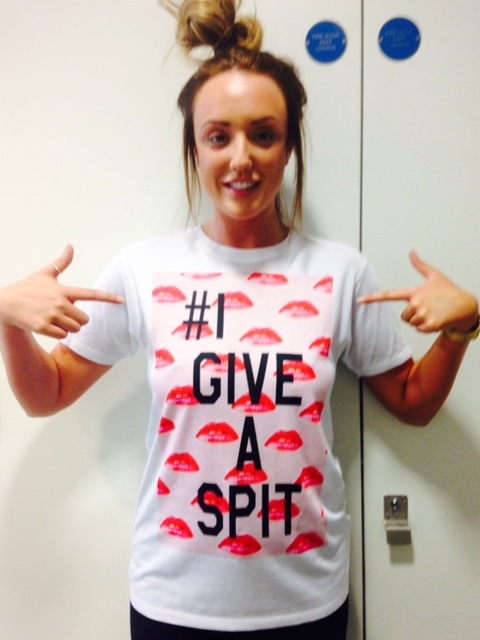 Geordie Shore star Charlotte Crosby is among a host of stars who have posed in designer #IGiveASpit t-shirts to raise awareness of the Anthony Nolan stem cell donor register. Fashion designer Ashish designed the exclusive t-shirt for Anthony Nolan, which carries the slogan #IGiveASpit, highlighting that joining the Anthony Nolan register of potential stem cell donors simply involves spitting into a tube – and caring enough to do it. Celebrities including Charlotte Crosby as well as Rose Leslie, who played Ygritte in Game of Thrones, TOWIE star Bobby Norris, Made in Chelsea favourite Stevie Johnson, newly announced Spider-Man actor Tom Holland, Blue singers Lee Ryan and Antony Costa, former Neon Jungle singer Amira McCarthy and EastEnders actress Kellie Shirley were invited to customise an #IGiveASpit t-shirt before posing for stunning images. Tasked with modelling the Ashish-designed #IGiveASpit t-shirt, celebrities styled it out with spraypaint, peepholes, glitter and even got the scissors out to put their own stamp on their garment. Charlotte designed her bespoke shirt in store at Topshop Oxford Circus, where you can visit the high-tech YR STORE boutique to customise and print your own #IGiveASpit t-shirt. Charlotte’s gorgeous design featured a glam lipstick print. The stylish photos have been released by Anthony Nolan to launch the #IGiveASpit campaign and urge more young donors to join the register. For people with blood cancer and other blood disorders, a stem cell transplant is often their last chance of survival. Anthony Nolan matches selfless people willing to donate their stem cells with people in desperate need of a transplant. PreviousMe Me Me Number 1 Bestseller!